I was looking forward to finally seeing Bringing Up Baby as I had never seen it and Cary Grant and Katherine Hepburn also star in one of my all-time favorite movies, The Philadelphia Story. 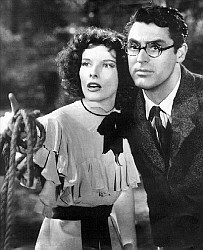 About the best I can say about Bringing Up Baby is that it was good practice for The Philadelphia Story which came out just two years later. They weren’t kidding when they classified Bringing Up Baby as a screwball comedy. Bringing Up Baby is the story of a mild-mannered museum scientist who accidentally gets mixed up with a nut job who of course he eventually falls in love with. This is, after all, 1938 Hollywood. I suppose some of the dialogue was witty, but for the most part the film was just dumb. There is a pet leopard and batty constable and a psychologist who thinks everyone is wacky because he only hears part of the story. A dog steals a dinosaur bone and they accidentally let a vicious leopard escape and they fall in lakes and burn socks over a campfire and…well…utter silliness all around. It’s sort of like a really bad Three Stooges film. The film apparently did quite awful at the box office and thankfully didn’t get nominated for an awards. Hepburn was quite off really, though Grant did play the dunce really well. I can’t explain why this film made the AFI list any more than I can explain why anyone would want a pet leopard named baby. Funny — we thought EXACTLY the same thing when we watched it last year. Genuinely claw-your-eyeballs-out bad. Have you hit the “Kurosawa” series yet?